(Charlottetown, P.E.I.) – Confederation Centre of the Arts presents Dance Umbrella’s annual showcase performance on Saturday, May 5 in the Homburg Theatre. 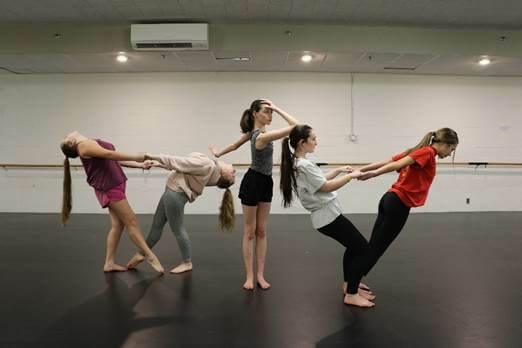 Photo cutline: Dance Umbrella’s students from the ITP-prep contemporary class practice for the annual showcase on May 5. From L-R: Ahnaïs Young, Jenna Dawson, Grace Arbing, Hannah MacLean and Alyssa Dalton.